Haunted houses, at least in our area, are always a big draw. The one volunteer fire company has been having a haunted house fundraiser annually in a friend’s barn for more than a decade now. It’s open every weekend throughout the month of October. And it’s always got a line waiting to get in. Man of the House (MOH) has a friend who sets up a haunted house in his garage every year, including an electric chair, which dang near made me pee myself the first time I sat in it. (It vibrates, makes loud noise, and air blows down at the top of your head, not to mention all the other lights go out.) He lets the trick or treaters go through and has a party for the adults on another night. He just loves Halloween, and this is his hobby. Every year he’s added another new [amazon_textlink asin=’B00EQHV7KA’ text=’Halloween prop’ template=’ProductLink’ store=’fosterpack-20′ marketplace=’US’ link_id=’8649a207-8cf8-11e7-8f68-57777830a467′]. Your nonprofit organization, too, can get in on the Halloween fun, and fundraising, with your own haunted house. The first step to having a successful haunted house fundraiser is finding a scary (but safe) location. When we were young, our youth group did one every year in an abandoned house that one of the families owned, at least until it became unsafe to have people tramping through it. Then they had it a few years in just a big metal building at the ball park that houses dinners and such, with a small stage. And as I mentioned before, the one local fire company hold their haunted house in a barn. So use your imagination, and ask all of your volunteers about the spookiest place they own or know of. Even a nice forested trail would be a great place to haunt. One of the ATV riding clubs around here does a haunted ATV ride every weekend in October. You haul in your own machines for the ride. Don’t forget to keep parking in mind. Haunted houses can draw quite the crowds. You want to be sure there is ample parking for your busy nights. After you’ve selected your venue, you’ll want to contact your insurance agent. Before any fundraising event, it’s always a good idea to check with your insurance agent to make sure you have all of the needed insurance and liability waivers. You’ll also want to check with the local township or borough, where your event will be held, to make sure you don’t need any special permits. Pick a theme for the entire haunted house fundraiser, or have a different theme for each room, scare spot on your haunted tour. Play off your location’s spookiest features. Enlist your volunteers as characters and for help with the decorations, planning, etc. The more the merrier. Solicit donations of Halloween [amazon_textlink asin=’B01ILDH1AY’ text=’decorations’ template=’ProductLink’ store=’fosterpack-20′ marketplace=’US’ link_id=’ac60269f-8cf8-11e7-8fa8-5d0d35cb0031′], [amazon_textlink asin=’B00282KOYK’ text=’costumes’ template=’ProductLink’ store=’fosterpack-20′ marketplace=’US’ link_id=’c084b528-8cf8-11e7-b21a-eba1fd3bb5b6′], and [amazon_textlink asin=’B00NY6WEXS’ text=’props’ template=’ProductLink’ store=’fosterpack-20′ marketplace=’US’ link_id=’d18c2527-8cf8-11e7-9e7a-c9f87aa3be61′]. If you’re planning this to be an annual event, remember you can always reuse, and re-purpose the props another year too. You can also enlist volunteers, who are great at making decorations or scaring people to make up treat bags for your guests or add in a Halloween themed refreshment stand or bake sale. 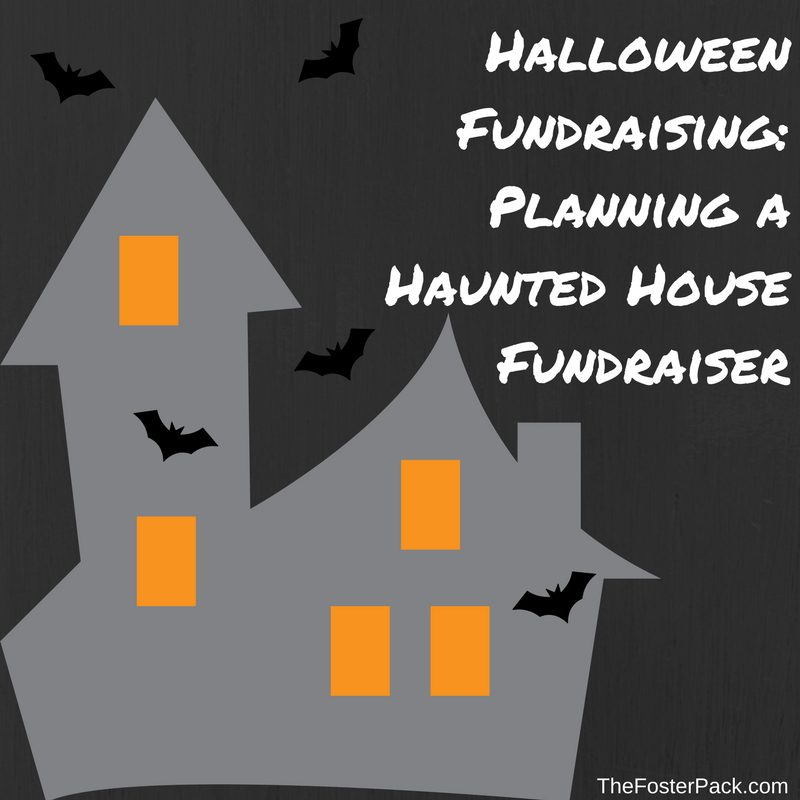 You’ll have so much fun planning your haunted house fundraiser, that it’ll become an annual event that the whole community will look forward to every year. Where are the creepiest places that you’ve been to a haunted house?